Most of the time we use an app on our smartphones to plan appointments, and anything we need to remember for the coming month. This has been working ok, but we often forget to write down the appointment or forget to set an alarm so we actually get a note beforehand. That’s why I really wanted to try making my own DIY monthly planner! We’ve been seeing a bigger and bigger need for actually having a real life monthly planner. A planner that we can hang somewhere where it easily will be seen every day. I just love the idea of having a monthly planner hanging in the kitchen. With a quick look, we can easily get an overview of what’s in store for the coming weeks and month. At first, I tried to find one I could buy, but I didn’t really find any planners that I liked. I did eventually find a few whiteboard planners I liked, but they turned out to be way too expensive. So of course, I ended up trying to make my own DIY monthly planner. If you would like to make your own DIY monthly planner, here’s an easy turorial. Canva is a great tool to start with if you’re not familiar with creating design printables. It’s a free online design tool with a really easy drag-and-drop feature. It also has many ready-made layouts, so you can easily create the most beautiful designs. Design the planner with 5 vertical x 7 horizontal squares. Add a section for filling in the month at the top, and add 7 small rectangles for adding each day of the week. Add small circles or squares at the top left/right of each square, so you can fill in the dates. You can also add extra sections for notes, groceries or a to do list. Design it just the way YOU like it, and adjust it to you and your family’s needs. Play around with the colors and fonts, and design a planner that fits in with your home’s decor and style. 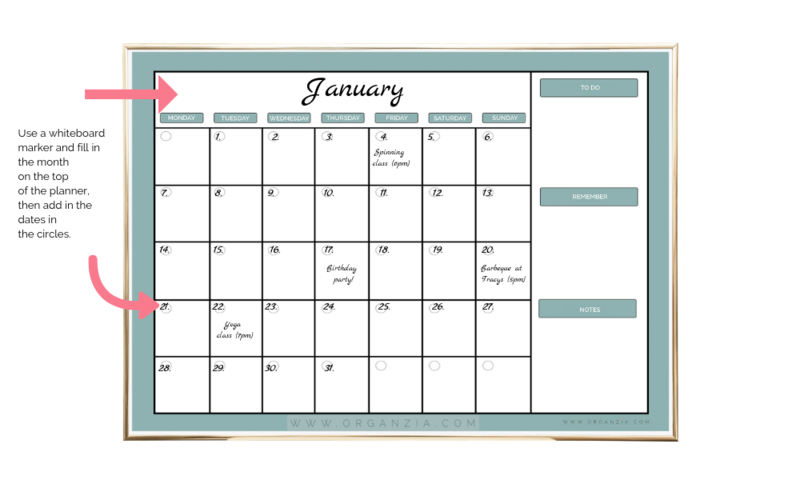 If you don’t want to make your own printable, you can get a free DIY Monthly Planner Printable when signing up to my newsletter. Now that you have your printable, either print it at home or at your nearest copy center. I printed my planner at the Staples copy center. I’ve tried both of these options, and they both work great! Looks good either way, but if you laminate the planner you can easily hang it up anywhere you like just using strips, or even hang it up on your fridge using magnets. Use a whiteboard marker, and write down the days of the month in the small circles and the month on the top. And there you have it! 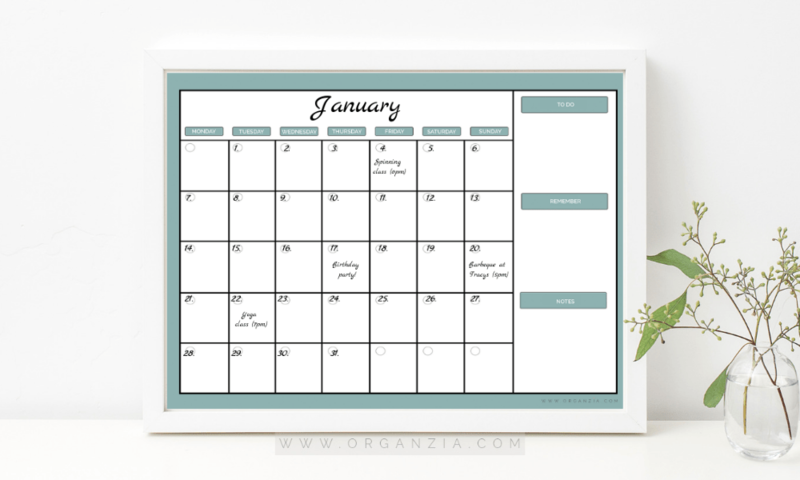 That’s how you can easily make your own simply dry erase monthly planner. Now you’re ready to organize and plan everything you need for the month to come! I love the fact that you just make it once, and then you can use it over and over again. Simply wipe away, and start over each month. Now how great is that?! Hope you enjoyed this tutorial, if you have any questions or feedback just let me know. Thank you Ciare, hope you try to make it , it’s really fast and easy to make ? Thank you very much! I like to have a monthly calendar in which I enter important dates by hand. I know we live in the digital age, but I like to see my manuscript. So I give meaning to the events. I love this idea. I used tape of mines. You’re welcome Iryna 😀 Glad you like it !